While levels of uncertainty are on the rise, many CFOs have the opportunity and the wherewithal to focus on corporate growth. And judging by the results of the 17 countries reporting in the 2015 Q1 edition of Global CFO Signals, they intend to take full advantage. New Zealand: A taste for growth, but no real hunger? Download the report for more on CFO sentiment in 2015 Q1. For several quarters now, CFOs globally have shared similar concerns—in particular, where the European and Chinese economies were headed and what effect the crises in the Middle East and the Ukraine would have on future growth. With some of those fears tempered this quarter and others being managed, many CFOs have the opportunity and wherewithal to focus on corporate growth. And judging by the results of the 17 countries reporting in the 2015 Q1 edition of Global CFO Signals, many intend to take advantage.The evidence is apparent in the strength of sentiment in several countries. In Australia, for example, CFO optimism has rebounded solidly in the wake of the lowering of interest rates in February. The number of CFOs in Spain reporting higher optimism (71 percent) reflects perceived continued momentum in that country’s economy. And in North America, CFOs recorded their ninth consecutive quarter of positive net optimism. The evidence is apparent in the strength of sentiment in several countries. In Australia, for example, CFO optimism has rebounded solidly in the wake of the lowering of interest rates in February. The number of CFOs in Spain reporting higher optimism (71 percent) reflects perceived continued momentum in that country’s economy. 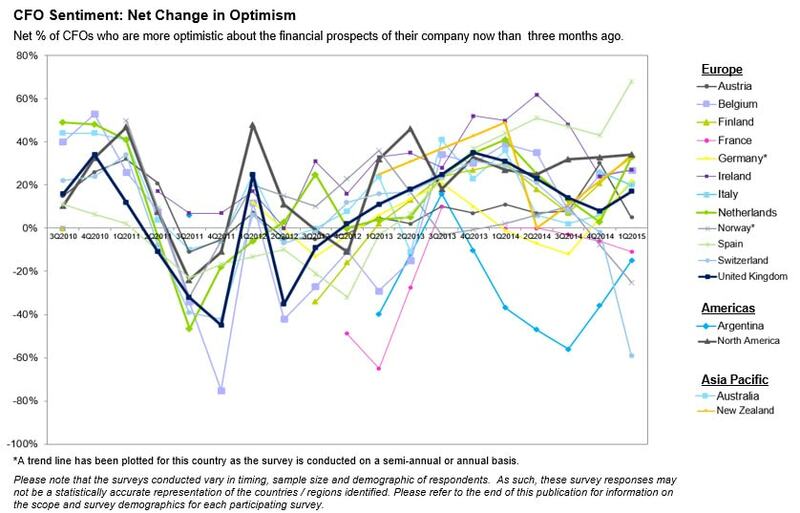 And in North America, CFOs recorded their ninth consecutive quarter of positive net optimism.That optimism is translating into growth strategies, particularly through organic means, in several countries, including Ireland and Italy. And positive revenue expectations can be seen among most countries reporting. Topping the list is the UK, where 82 percent of CFOs expect an increase—well above their long-term average. That optimism is translating into growth strategies, particularly through organic means, in several countries, including Ireland and Italy. And positive revenue expectations can be seen among most countries reporting. Topping the list is the UK, where 82 percent of CFOs expect an increase—well above their long-term average.As is common, there are some problem areas. In Switzerland, for example, where many CFOs were taken by surprise by the recent removal of the exchange-rate floor, a net 80 percent now rate the level of uncertainty as high. In Norway, CFOs are troubled by low oil prices, and in France economic uncertainty still weighs heavily. Still, Kalish notes, there are reasons why levels of uncertainty are on the rise among CFOs this quarter, including the direction of the US dollar, demand in overseas markets, such as China, and government policies. In the UK, for example, uncertainty about post-election reforms was seen as the greatest threat to UK business, according to that country’s CFOs, who were surveyed before the voting. It’s one reason defensive strategies, such as cost cutting and increasing cash flow, reemerged as top priorities there—and never seem to go out of favor among CFOs. The streak continues in North America: net optimism now sits at its second-highest level during a nine-quarter positive run. Moreover, emboldened by the strength of the region’s economy and the prospects for that economy, CFOs indicated their highest-ever bias toward growing revenue over cutting costs and toward investing cash over returning it to shareholders. And that confidence is translating into domestic hiring expectations, which now stand at 2.4 percent, matching the highest levels seen in four years. The tumultuous quarter in the energy sector, however, contributed to a dip in sales expectations, which fell to 5.4 percent from 6.0 percent the previous quarter. Capital spending expectations also declined slightly from 5.5 percent to 5.2 percent, but earnings expectations rose from 9.7 percent to 10.6 percent. On the other hand, in the one South American country reporting—Argentina—CFO outlooks remain tempered due to an apparent lack of confidence in the government’s ability to enact effective economic policies. After three sluggish quarters, Australia’s CFOs are feeling much more upbeat with net optimism at 21 percent, up from 6 percent last quarter. Driving that trend is a lower Australian dollar and record low interest rates, with more than 90 percent of CFOs now expecting the dollar to sit at or below US $0.80 in 12 months’ time. In addition, even though uncertainty is up, more than half of CFOs believe now is a good time to take on risk—up 24 percent—perhaps because policy uncertainty and a slowing China haven’t negated the strong underlying drivers of “lower for longer” interest rates and a falling exchange rate. Meanwhile, in nearby New Zealand, the third annual CFO survey finds finance chiefs optimistic, but a little less so than a year ago. And while they are bullish on both their country and companies, their main strategies for expansion are very much linked to growing existing businesses through organic expansion and the introduction of new products or markets. Not surprisingly, there is much diversity across Europe. Spain’s CFOs, for example, are the most optimistic (net 67 percent) reflecting improvements in that country’s growth prospects following a double dip recession. At the other end of the spectrum, Switzerland’s CFOs are the least optimistic (net -58 percent) thanks to the appreciation in the Swiss franc. What CFOs seem united on, though, is that uncertainty is on the rise. CFOs in all major European countries surveyed, except Ireland and Norway, see a greater level of financial and economic uncertainty facing their businesses. In response, defensive strategies are particularly in favor in Europe, and cash is listed as a concern among nearly all countries surveyed. That is not taming their business expectations, however. Most CFOs (except Switzerland’s) report strong expectations for revenue—particularly in Belgium, Germany, Ireland, Italy, Spain, and the UK. Ireland’s CFOs also are reporting solid increases in capital spending and hiring. Going forward, the CFOs also seem to know what measures should be taken to increase their prospects and resolve the current euro area growth crisis. In a special question asked in the inaugural European CFO Survey, the CFOs favored an increase in national structural reforms followed by an increase in public/pan-European investment spending. For more information, view the complete report at www.deloitteresearchemea.com. Appetite for risk is highly relative this quarter. In the UK, a solid 51 percent of CFOs say now is the time to take greater risk onto their balance sheets—but that is actually a two-year low. The figure also stands at 51 percent in Australia, but that is a marked improvement fueled by the recent lowering of interest rates. And while just under a third of Germany’s CFOs cite an appetite for risk, that’s the highest level in three years. Meanwhile in Austria fears of increased regulation, among others, have led to the lowest level (11 percent) in this survey. Uncertainty continues to cause consternation. The CFOs of Germany and Switzerland, two countries that have historically benefited from overall stability, perceived the highest levels of uncertainty, at net 82 percent and 80 percent respectively. In Australia, uncertainty remains high despite the positive influence of lower interest rates and a weaker Australian dollar. Much lower levels were reported by CFOs in Italy, Norway, and Ireland, where a net 9 percent of CFOs view the external environment as uncertain, down from 55 percent last quarter. Revenue expectations remain solid. Some 82 percent of CFOs in the UK and Italy expect their revenue to rise in the next 12 months as do 79 percent of Australia’s CFOs. Moreover, half of Sweden’s CFOs say their companies can grow 4 percent to 6 percent in that time. Positive margins outlooks are also reported in Italy (77 percent), Finland (65 percent), and Belgium (62 percent), among others. In Switzerland, however, the exchange-rate situation has CFOs rethinking forecasts: just 17 percent expect revenue to rise, and there is a sharp decline in margin expectations. Globally, the news on the job front is somewhat encouraging. Domestic hiring expectations in North America, for example, rose to 2.4 percent, matching their highest level in two years. In Ireland, 70 percent of CFOs surveyed expect employee levels to increase over the next 12 months, as do almost 40 percent of Australian CFOs. In Switzerland, however, 59 percent of finance chiefs expect the number of employees in their companies to decrease in the next 12 months, and 25 percent of Finland’s CFOs expect cuts domestically in the next six months. Many CFOs continue to eye growth. North America’s CFOs indicate their highest-yet bias toward growing revenues and investing cash. In Ireland, 82 percent of CFOs believe their company’s strategy is expansionary, particularly through organic means. Meanwhile, other countries, such as New Zealand and Italy also cite new product and new market introductions. Still, the importance of defensive strategies remains strong. The ingredients for increased M&A remain: strong balance sheets, available financing, and perceived opportunities. Some 96 percent of the Netherlands’ CFOs expect M&A activity to increase in the next 12 months, as do 83 percent of Spain’s, and the number is 67 percent among Finland’s CFO if you add in divestitures. In Belgium, 40 percent of CFOs have expansion through M&A activity on their list of business priorities. To access the other Signals Reports please visit the "library" page.